Sukha = happiness, joy, comfort, ease. •	Sit in Dandasana (Staff Pose). Be up on at least two blankets to make it easy to sit comfortably. •	Do the same with the left leg. •	Cross the legs at the shin so that the thighs are parallel, pointing forward, and not coming out to the side in a “v”. •	Adjust the legs so that the knees are the same height off the floor. •	Tuck the outer edges of the feet under so that they rest on the edge and not on the top of the foot. 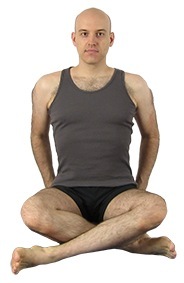 •	Sit upright and place the backs of the hands on the thighs. Have the head centered and roll the eyes down to gaze at the floor. Hold this position for a few breaths. •	Release and return to Dandasana (Staff Pose) and repeat on the other side. •	Let the thighs turn out. •	Release the tops of the thighs down into the floor. •	Soften the lower back and broaden the back ribs. •	Lift and lengthen the sides of the trunk.